During the course of the nineteenth century, Mozart became the symbol of the select, exquisite and beautiful, an image that the twentieth-century commodity industry exploited to the fullest. In a cunningly crafted covering text for this fountain pen, ingenuity and creativity are associated with the physical act of writing itself. "Wer schreibt, der komponiert" ("He who writes, composes"). This high-quality fountain pen itself was purportedly conceived with the demand for precision and perfection, so that the object in turn can become the source for the effusions of our souls. Dedicated to the purest of geniuses: the childhood genius Wolfgang Amadeus Mozart. 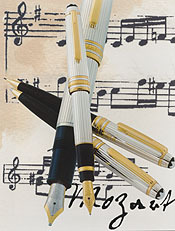 Hommage à Wolfgang Amadeus Mozart, Special Edition Fountain Pen, Montblanc Pens.